Povidone-Iodine sterile wipes are a hospital quality effective medical and first aid antiseptic solution to prevent Infections of minor cuts, wounds & abrasions. The Povidone-Iodine sterile wipes, come in a convenient single-use form, in boxes (10 to 1000 pads) to use at home, business, schools or any other public building. Also, ideal for antiseptic skin preparation, venipuncture, IV starts, renal dialysis, pre-op prepping and other minor invasive procedures. Wholesale-Direct also offers Povidone-Iodine swabsticks. Providone-Iodine Infection Wipes There are 6 products. 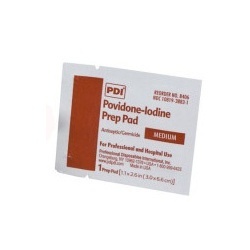 Povidone-Iodine infection control wipe/Case of 6 @ $1.46 ea. 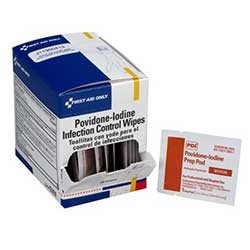 Povidone-Iodine infection control wipe/Case of 6 @ $1.46 ea.